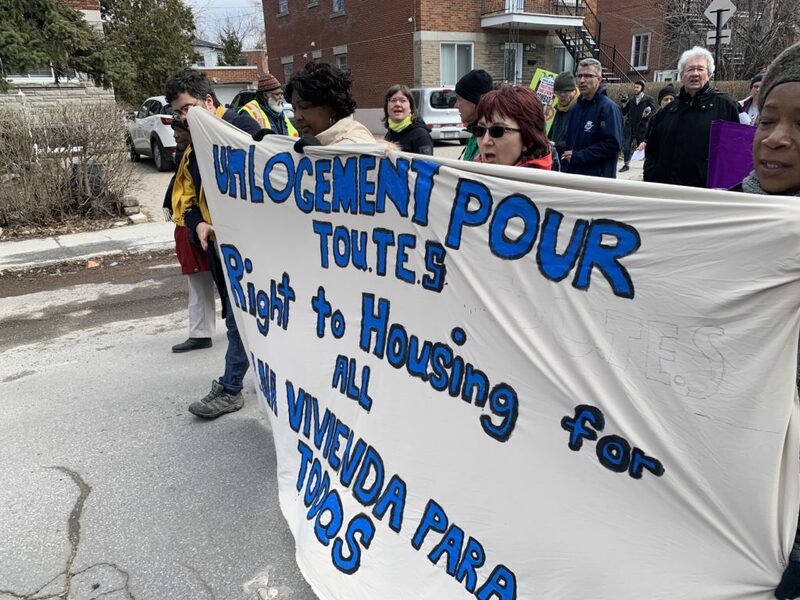 Montreal, April 6th, 2019 – In the context of scarcity of available rental units in the Montreal metropolitan region, the Front d’action populaire en réaménagement urbain (FRAPRU) denounces discrimination in access to housing. Responding to the organization’s invitation, a few hundred people demonstrate for the right to housing for all in the St-Michel neighborhood. Tenants who have immigrated or who are people of color generally pay higher rent than non-immigrant households, points out the coalition. Such households are also more likely to live in apartments that are too small, and are often victims of discrimination when seeking housing. « Though it’s completely illegal, people of color and indigenous people are often openly refused apartments when the landlord sees their race, religion or indigeneity, » denounces Véronique Laflamme, FRAPRU’s spokesperson. The coalition also points out that recourses for victims of discrimination are poorly known and that it is difficult to seek any restitution. « Sadly, there is also discrimination in the subsidized social housing that we advocate for in order to improve housing conditions, » points out Véronique Laflamme. Tenants of irregular or precarious immigration status (including those with work permits, refugee claimants or those who are undocumented) do not have the right to subsidized social housing units, one of the last options for families who are at risk of homelessness. According to the Règlement sur l’admissibilité aux logements à loyer modique, only permanent residents are admissible. The FRAPRU is all the more concerned given that the Canadian Housing and Mortgage Corporation has documented a lack of available rental units in many cities in Quebec, especially in Montreal and Gatineau areas. In Montreal the vacancy rate is below 2% for all rental units (1.9% for two-bedroom units and 0.8% for units of three bedrooms or more), the lowest in 14 years. For family dwellings of 3 bedrooms and more, this number neighbours 0%. « In the borough of Villeray – Saint-Michel – Parc-Extension, the situation is dramatic, with only 0.7% of apartments available, » points out Olivier Vézina of the housing information service of the Centre éducatif communautaire René Goupil, a community organization that supports the demonstration. While hundreds of thousands of tenant families in Quebec have major housing difficulties, the FRAPRU is concerned that the CAQ government presented one of the worst budgets for social housing of the last 20 years. « In the current context, we need many more social housing units that are accessible to all, regardless of immigration status, » Véronique Laflamme insists. She points out that social housing provides a long-term answer to the needs of low-income households, ensuring that there are truly affordable apartments, and fulfilling people’s right to the city. « In Saint-Michel, for example, we demand the construction of social housing units on the site of the former Francon quarry, » explains Olivier Vézina. However, the first budget of the Legault government offered nothing new, only the adjustment of budgets for the AccèsLogis programme in order to deliver, over the next seven years, the units that had already been announced in previous budgets of the last ten years. The FRAPRU calls this decision irresponsible. The FRAPRU calls for the financing of 50 000 new social housing units in five years, improved recourses for people facing discrimination, a campaign of public awareness on the subject, and access to social housing for all, regardless of immigration status.